IEBC Chairman Wafula Chebukati ready for talks between Uhuru and Raila over the 26th October Polls. - Bana Kenya News, Real African Network Tubanane. Home Nairobi IEBC Chairman Wafula Chebukati ready for talks between Uhuru and Raila over the 26th October Polls. IEBC Chairman Wafula Chebukati ready for talks between Uhuru and Raila over the 26th October Polls. The IEBC Chairman Wafula Chebukati has opened a door for dialogue between the two party leaders. Raila Odinga and President Uhuru Kenyatta have been called out for dialogue by Chebukati as it will save the country. Chebukati pushed for dialogue and finish the elections as Kenya has used a lot of Money in the Election preparations and should continue on the 26th October 2017. 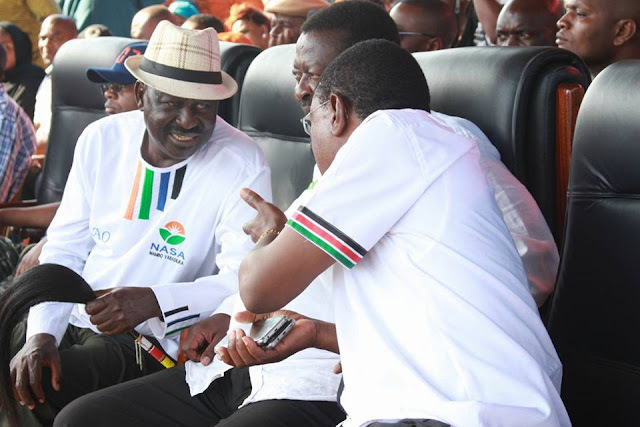 President Uhuru Kenyatta and his deputy William Ruto who referred Raila Odinga as Muguruki and Mganga have refuted and denied that they will be in the dialogue. "I cannot be in whatever dialogue, People will vote and nothing like locking ourselves in a room for power sharing and half-loaf government." President Uhuru Kenyatta said. “As a lawyer, I cannot continue to be pushed by majority commissioners to accept legal opinions that serve partisan interests and are not grounded in the Constitution and the law. At the least, this is intellectual dishonesty for which my professional training demands that I loathe,” Chebukati said. "It is already painful to be on record as the Chairman of the IEBC that presided over a presidential election that was nullified by the Supreme Court. I ask the staff adversely mentioned to step aside and allow the project team to function without interference,” Chebukati said. “I would rather bow out with my name intact and my head lifted high than being part of a process where personal interests dwarf the interests of the nation. I realize my actions in this noble office will define me for life. My actions will become my legacy and the reference point not only to my life but that of my family. I am therefore not ready to sacrifice an eternal legacy for short-term gains that will sear my conscience,” he stated. Chebukati insisted that the elections be free, fair and credible, political party captains need to come together and talk before the elections. "I'm ready to conduct talks between the two people and making sure the country goes on as no one is more human than the other." He stated. “Once there is political agreement as a result of dialogue, when there is genuine commitment to let the commission work independently, when all commissioners and staff truly commit to serving the country, rather than partisan political interests; and when we work together to create a conducive environment for Kenyans to express their sovereign will, then I can truly be confident of having presidential elections. Only then can I commit to serve as the National Returning Officer,” Chebukati said at the Bomas of Kenya. “The lesson ... is that dismissing the withdrawal of candidates with large numbers of votes does not improve the economic, political or social situation. In fact, it leads to deep crisis,” Chebukati warned. He urged the IEBC secretariat team that has been alleged to sabotaged the August polls to resign. " The referred people who have been in the consistent talk by the Politicians should follow suit as the resigned commissioner in order to have credible elections." He stated. The President and the Opposition leader have urged their supporters to stand firm on the presidential poll repetition day. Both leaders have stood firm on dialogue that they will not meet as no half-loaf government will be constituted after 26th October 2017.